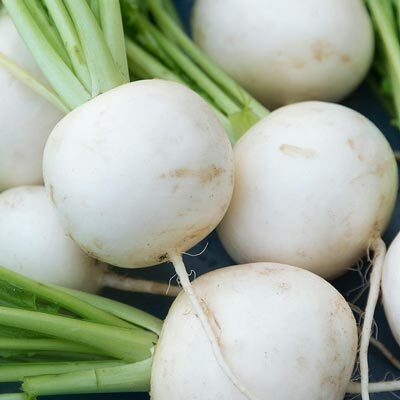 Globe-shaped, pure white, tender roots grow quickly in low temperatures and are slow to bolt. For best flavor, harvest when at a 2 in. diameter. 40-45 DAYS. For each offer ordered, get Approx. 400 seeds..
Spacing: 1-2 inches. Thin plants to 6 - 8 inches apart. Seed Count: Approximatley 400 seeds per packet. Fruit: Pure white, globe-shaped bulbs.